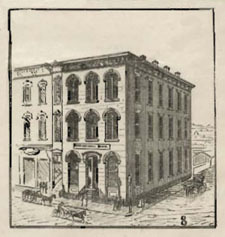 The First National Bank, then located on the southwest corner of Sixth and Market Streets, was organized in 1865 with a capital of $200,000.00. W. P. Rathburn was President; T. R. Stanley, Vice President; and Theodore G. Montague, Cashier. The Directors were the same, together with Charles W. Stewart and John King. Mr. Rathburn's beautiful ante-bellum home, located at the corner of Pine and West Sixth Streets, and later known as the Nottingham home, has long been one of the landmarks of Chattanooga. Mr. Montague was the father of Theodore L. Montague. Upon the death of Mr. Rathburn, Theodore G. Montague succeeded to the Presidency of the bank, and was for many years an outstanding figure in the business and social life of the community, rendering financial aid to many of the struggling firms of that day. He had faith in the future of Chattanooga and the success of many of our strongest business houses of today may be attributed to a large extent to his sound policies. He was the brother of the late D. P. Montague, one of the original directors and stockholders of the Hamilton National Bank, which was organized in 1905. On December 31, 1932, the First National Bank underwent reorganization and reopened on January 3, 1933, as the Chattanooga National Bank. In 1870 the City National Bank began business at the southeast corner of Seventh and Market Streets, the present location of Baker's Shoe Store. The officers were P. M. Craigmiles, President; J. H. Craigmiles, Vice President; and D. C. McMillan, Cashier.  These, together with Jonathan P. Wood, Tomlinson Fort, R. M. Hooke, J. L. Devine, and R. L. Watkins, composed the list of directors. It was capitalized at $200,000.00, and suspended business in 1875. Mr. Watkins was the father of Chester Watkins and R. M. Watkins, well known citizens of today. Mr. Hooke was an uncle of Doctors J. Park and S. J. McCallie, founders of the McCallie School for Boys, and highly respected citizens of Chattanooga at the present time. The Third National Bank continued in business for approximately twenty years. Major J. H. Warner was President; D. E. Rees, Vice President; and W. E. Baskette, Cashier. Major Warner was the father of Porter Warner, one of Chattanooga's present day citizens. Warner Park, the city's largest recreational spot, was named in his honor. In 1882, he was succeeded in the Presidency by D. E. Rees. J. P. Smartt became Vice President and C. R. Gaskill was made Assistant Cashier. Mr. Smartt was the father of Ed Smartt, a well known citizen of Chattanooga today. In 1887, J. A. Hart succeeded to the Presidency. W. B. Mitchell, whose daughter, Mrs. Beulah M. Hailey, now lives on Lookout Mountain, also served as President of this institution. 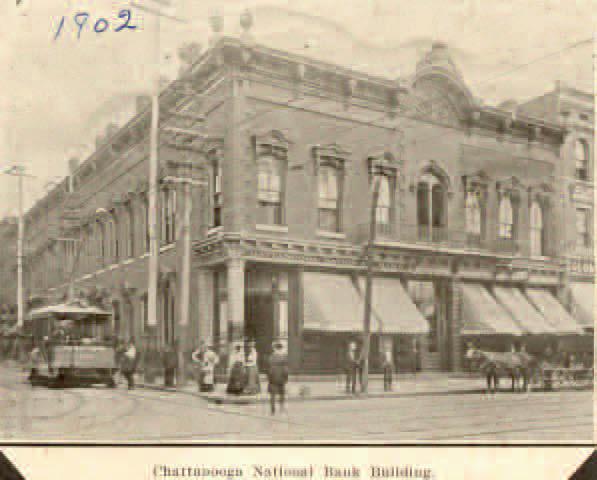 In 1902 the Third National Bank was absorbed by the Chattanooga National Bank. 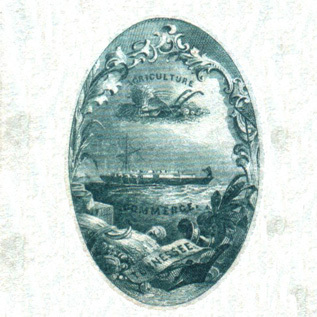 The Chattanooga National Bank was incorporated in 1887, capitalized at $300,000. Captain Chas. A. Lyerly was President; T. L. Cate, Vice President; and J. S. Q'Neale, Cashier. J. T. Lupton was Vice President for several years. Mr. Lupton, one of the most able business men ever to live in Chattanooga, was the father of Carter Lupton, now one of Chattanooga's outstanding and most influential citizens. 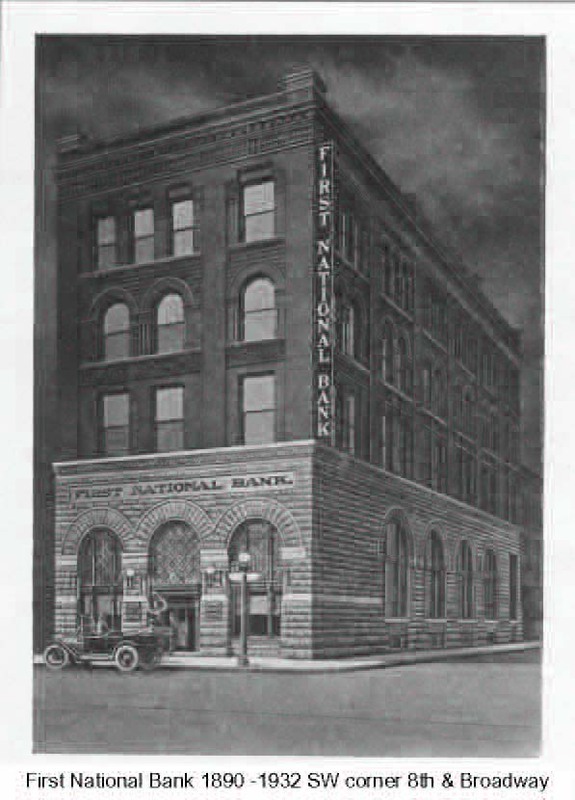 In 1905 a consolidation was effected between this bank and the First National Bank, and the combined institutions operated as the First National Bank. Captain Lyerly was for many years, until his death in 1925, President of the First National, and one of the most highly respected figures in the Chattanooga business world. In July, 1908, the Citizens became a National bank and adopted the name of Citizens National Bank, with G. N. Henson, President; G. W. Davenport and C. D. Mitchell, Vice Presidents; Herbert Bushnell, Cashier; and J. B. F. Lowry and Horace Henson, Assistant Cashiers. In 1916 it was absorbed by the Hamilton National Bank. Mr. Bushnell was made Vice President and Mr. Lowry Cashier of the consolidated banks. The Fourth National Bank was organized in 1889 with a paid-in capital of $200,000.00, and was located on East Eighth Street. Major J. H. Warner was President; C. D. dark and J. M. Lee, Vice Presidents; and C. R. Gaskill, Cashier. Mr. Lee was the father of Tom W. Lee, the well known citizen of our neighboring community of Chickamauga, Georgia, and of the late Gordon Lee, who ably represented the seventh Georgia district in Congress for many years. In 1893 this bank was absorbed by Wiehl, Probasco and Company. The Merchants National Bank was organized in 1890, and was located in the building on Market Street now occupied by Burchay's, Furriers. C. D. Beebe was President; C. H. Hensel and N .O. Fuller, Vice Presidents; and R. W. Barr, Cashier. This bank was absorbed in 1894 by the Citizens Bank and Trust Company. In 1905 Mr. T. R. Preston and his brother, Mr. C. M. Preston, seeing the need of additional banking facilities for the city of Chattanooga, with their associates organized the Hamilton National Bank. Six years after its organization, it completed the erection of its fifteen-story office building on the southwest corner of Seventh and Market Streets, the site of the old Third National Bank. T. R. Preston was made President; H. T. Olmsted, Vice President; G. H. Miller, Vice President; C. M. Preston, Cashier; and C. I. Knoedler, Assistant Cashier. Mr. Olmsted was the father of Roland W. Olmsted, now one of the directors of the Hamilton National Bank. Mr. Miller was the father of Felix G. Miller, President of Miller Brothers Company, and also at present a director of the bank. The original capitalization was $250,000.00, and since its organization the capital stock has been increased several times until now it stands at $2,000,000.00, with surplus of $4,000,000.00, with other funds bringing the total capital structure up to over $7,000,000.00. This large increase in its capital has been necessitated by the continued growth and prosperity of the institution, few banks having as good a record in proportion to the size of the city and the number of years of its existence. In 1920 the stockholders of the Hamilton National Bank purchased the stock of the Hamilton Trust and Savings Bank, and in 1929 the two banks merged into one institution. The enlarged bank, the largest in East Tennessee and the fourth largest in Tennessee, with its six branches, services approximately 70,000 accounts of various kinds. As the parent bank and headquarters of the Hamilton National Associates, it fosters a most complete and flexible financial service to this and sixteen other communities in East Tennessee and North Georgia. The Hamilton National Bank is a member of the Federal Reserve System and of the Federal Deposit Insurance Corporation, and is a designated depository of the United States, State of Tennessee, Hamilton County, and the City of Chattanooga. 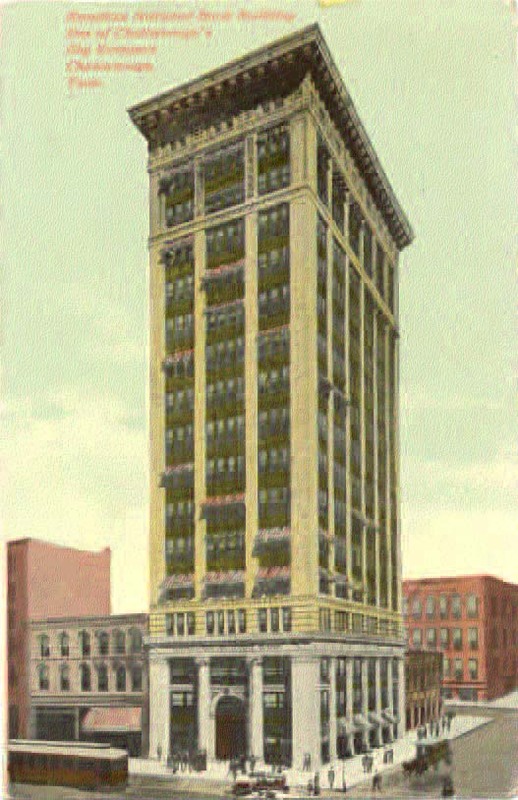 The Bank of Chattanooga was succeeded in 1905 by the American National Bank, with H. S. Probasco, President; Jo C. Guild and Z. C. Patten, Sr., Vice Presidents; F. A. Nelson, Cashier; and George W. Gardenhire, Assistant Cashier. Mr. Guild was the father of JO Conn Guild, for many years President of the Tennessee Electric Power Company, and now President of Southern Coach Lines, Inc. Upon the death of Mr. Guild, Mr. Patten continued as the only Vice President. In 1911 the business of this bank was absorbed by the First National Bank. The American Trust and Banking Company was converted to a national bank under the name of American National Bank and Trust Company in 1948.  Its capital, surplus, and profits are now in excess of $4,000.000.00. Four branches are operated one of them being the former St. Elmo Bank and Trust Company. E. Y. Chapin is now Honorary Chairman of the Board of Directors; S. L. Probasco, Chairman of the Board; and E. Y. Chapin, Jr., President. In August, 1933, the Commercial National Bank opened for business in the quarters at the northeast corner of Eighth and Broad Streets, formerly occupied in succession by the Chattanooga Savings Bank and Trust Company, First National Bank, and Chattanooga National Bank. Officers were: Z. C. Patten, President; Edward Finlay, Vice President; Robert L. Hall, Executive Vice President; Gordon L. Nichols, Cashier; and H. A. Minor and W. H. DeWitt, Assistant Cashiers. The capital was $650,000.00, with surplus of $100,000.00. The published statement of condition on October 25, 1933, showed deposits of nearly $4,000,000.00, and total resources of nearly $5,000,000.00. On October 21, 1941, the Commercial National was acquired by the American Trust and Banking Company, and merged with that institution. On January 3, 1933, the Chattanooga National Bank opened as the successor to the First National Bank, which had undergone reorganization on December 31, 1932. Capital, Surplus, and Undivided Profits were approximately $3,000,000.00, and deposits, taken over from the First National, were over $14,000,000.00. The officers were W. E. Brock, President; Z. C. Patten, H. R. Rutland, T. R. Durham, and R. W. Peery, Vice Presidents; J. R. Higgins, J. W. Durrett, and J. V. Holdam, Assistant Vice Presidents; W. H. DeWitt, Cashier; G. L. Nichols and P. H. Stegall, Assistant Cashiers; H. A. Minor, Comptroller; and W. M. Vickers, Auditor. After the banking holiday proclaimed in March, 1933, this bank did not reopen and was liquidated under the direction of the Comptroller of the Currency. The depositors eventually received the full amount of their deposits. No National Bank Notes were issued by the short lived second Bank of Chattanooga.